What is Equity Mutual Fund & Benefits of Equity? Equity has historically proven to be the one of the best wealth creator among various asset classes. Consider this - S&P BSE Sensex – domestic representative of the asset class - has returned 15% on average, for a 15-year holding period ended March 28, 2018 on a daily rolling basis since its inception (1979). While investors can benefit from the asset class by directly investing in stocks, the do-it-yourself process is time consuming and requires necessary skills. A simple way to overcome these challenges is to invest in equity mutual funds as they are professionally managed. Equity is volatile in the short term and can be overcome only by being patient and investing over a long term. 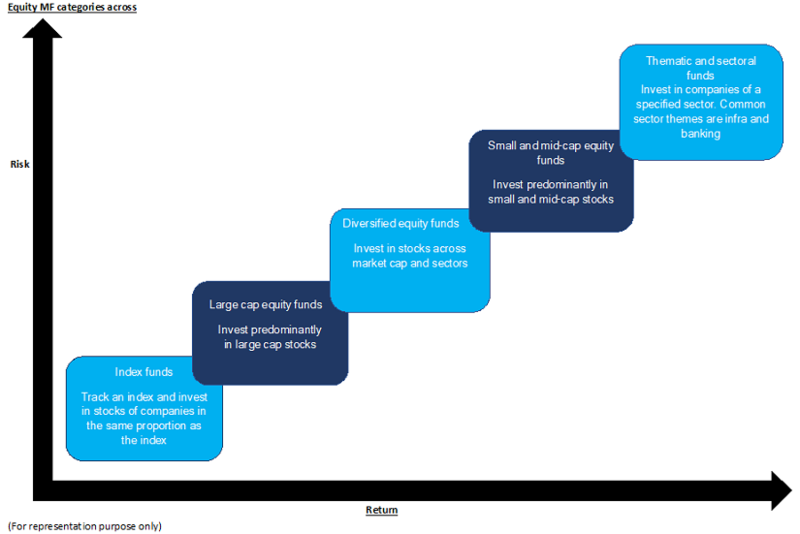 Equity funds have the capability to generate reasonable returns–especially over the long term. 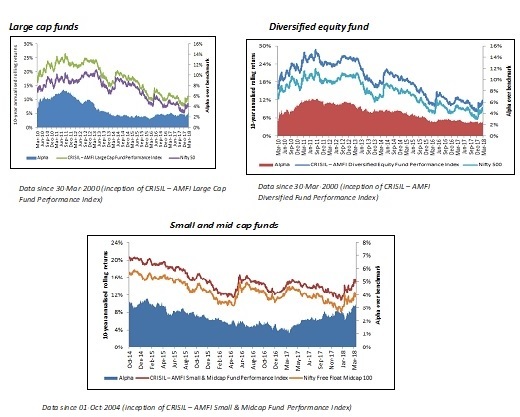 A rolling returns analysis for 10-year holding period of large cap, diversified equity, and small and midcap funds, represented by CRISIL-AMFI mutual fund performance indices, outperformed their benchmarks, on average, by 4%, 4% and 2%, respectively, since inception of the respective indices. Staying invested over the long term could also reduce volatility associated with Staying invested over the long term could also reduce volatility associated with equity funds​. An analysis of rolling returns showed that large cap, diversified and small & mid-cap funds (represented by CRISIL-AMFI mutual fund performance indices) had standard deviation (which measures volatility) of 36%, 31% and 36%, respectively for a one year holding period ended March 2018. However, it dropped to 6%, 5% and 3% each in all categories for a 10-year holding period ended March 2018. One can invest either a lump sum in equity mutual funds or choose the Systematic Investment Plan (SIP). Lump sum requires bigger investment amount at one time which may not be possible for all investors. SIP requires a smaller investment at regular intervals which aids in averaging the cost per unit as investors invest during both high and low points of the market. It also helps to irons out volatility associated with the equity market. Investing a small amount regularly could multiply to a large corpus through the power of compounding. However, do not stop SIP when the market trends southward. Downturn could be the best time to accumulate more units and ultimately create more wealth. Hold on to your investments over the long term. Equity funds help minimise the concentration risk as investment is well diversified across stocks, sectors and market capitalisation. Investors keen on investing in equity funds have a wide variety to choose from. They can park money in diversified, large cap or index funds. Those with higher risk appetite can look at small and mid-cap funds or thematic/sectoral funds. Equity funds can also aid in tax planning through equity-linked savings schemes (ELSS) wherein investments up to Rs 1.5 lakh per financial year qualify for tax deduction (for Individuals and HUF) under Section 80C of the Income Tax Act. Investors can choose funds based on their risk-return objectives and time horizon. Investing over the long term is one of the best ways to help generate wealth via equity funds. Hence, hold on to your investments and regularly review the portfolio. Before investing, look for consistent performers and invest in line with your goals and risk-return parameters. Mutual Fund investments ​are subject to market risks, read all scheme related documents carefully.